Prices of bitcoin have been on the descent over the last eight days after breaking below their previous support level of around $550 that had marked an area of buying demand since the beginning of June. While the selling pressure has become part of the normal ebb and flow we have seen in prices of bitcoin, and are reflective of nearly all speculative assets, outsized movements taking place on individual exchanges has led to question what triggered to outsized activity on those venues. Example 1: Among exchanges, prices on Bitstamp and Bitfinex are known to correlate closely. This changed temporarily on August 14th as prices fell from $525 to $450 on Bitfinex in a matter of minutes before rebounding to settle around the $500 area. 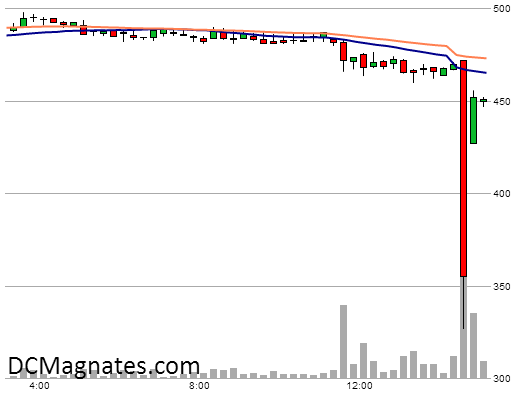 At the same time, prices on Bitstamp only declined to low $505. Example 2: Causing the previous example to look like a walk in the park, yesterday’s trading action on BTC-e was a full fledge flash crash. Trading at $470, abnormal selling on BTC-e caused a full-fledged melt down as prices spiked to a low of $327 within five minutes. During the same period, prices of bitcoin at major exchanges also fell, but only about $20. So what caused the drops? Being theorized has been the role of margin within bitcoin trading. Similar to trading conditions offered by brokerages for stocks, with margin, customers are allowed to buy or sell positions using borrowed funds. For example, an account with $5000 and 2:1 margin can buy $10,000 worth of Apple stock. To prevent brokerages from losing their own funds, customers with losing positions receive what is a called a ‘Margin Call’ that instructs them to deposit addition cash to their account, or decrease their position size. Failing to do either can lead to a positions being liquidated by the broker. In the case of bitcoin, several exchanges such as Bitfinex and BTC-e offer similar margin style trading with leverage up to 3:1. As a result, customers of both exchanges are vulnerable to forced liquidations when using margin and having unprofitable positions. As prices fall, traders are often known to ‘double down’ on their positions, which can trigger increased risk and greater chances of a margin call taking place. In explaining the drop in prices recently of bitcoins, Pantera Capital has cited margin trading as a leading cause of the drop in their notes to clients. In yesterday’s weekly BitFlash report (sent before the BTC-e crash), they cited analysis from Matlab Trading which analyzed margin use on Bitfinex and theorized that margin call selling caused lower prices and triggered additional margin calls and liquidation. Pantera than followed up yesterday’s trading with another letter to clients focused entirely on the subject of margin trading where they commented that “margin trading may be the primary cause of the recent price drop we have seen in bitcoin.” Pantera again quotes analysis from Matlab Trading, while also adding that data from Bitfinex shows a decline of customer borrowing from above $30M to just below $20M. The decline in margin would seem to indicate deleveraging taking place as the result of forced selling. The well-publicized increase in merchant acceptance may have led traders to become more bullish about bitcoin’s price, encouraging increased margin positions. Unfortunately, these positive developments may have actually led to downward price pressure, with margin calls precipitating a sharper market drop.